We’d love your help. Let us know what’s wrong with this preview of Ashes of Arson by Greg Clark. Insurance adjuster, Kati MacKenzie never intended to be an amateur detective. Nor did she ever dream that her quiet, boring job could suddenly become so dangerous. But, when two charred bodies turned up in the ashes of a warehouse fire that she was investigating, she knew her life had just changed. Kati rapidly went from a sweet, pampered Southern girl in a small Alabama town to a hunted amateur detective trying to solve a crime, in order to stay alive. Things like getting beat up, shot at and almost run over started happening more and more frequently and carrying a gun became a daily necessity. The body count began climbing up and, before the smoke had cleared, Kati was even forced to add one to the pile herself. 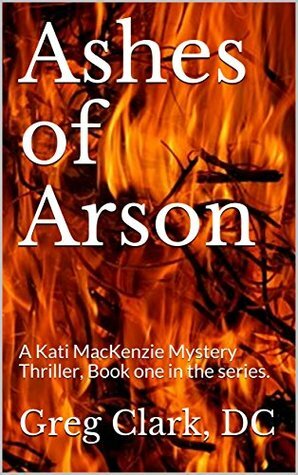 Like it or not, Kati became an unwilling detective in a suspense thriller plot of arson, murder and romance. Kati’s quest for the truth in this tale became more complicated when she realized that the bad guys were always one step ahead of her. It was almost like someone was spying on her. Could someone close to her be conspiring to ensure her downfall? Somehow, through all this mayhem and suspense, a gorgeous cop named Rex, a handsome hero fireman named Rich and a nine year old boy named Toby manage to keep Kati on track and safe. Along with the help of her trusty .38, of course. Can Kati stay alive long enough to solve the multiple murders and the arson mystery? Can she overcome a disastrous marriage and divorce and fall in love again? Will the overlying crime cartel let her alone if she does solve the case? And will her mother’s world famous cinnamon buns save the day? Click the “Buy” button now, read on and find out. You, too, can join in on the saga of Kati MacKenzie and her thrilling adventures and rocky love life. Be sure to also to go to www.facebook/gregclarkdc so you can keep up with new releases of Kati’s adventures. Ashes of Arson by Gregory Clark is book number one in the Kati MacKenzie mystery saga. Stay tuned for book number two, Arson Revisited, coming soon. Greg Clark is a retired Chiropractor with twenty years in practice. He’s very familiar with the insurance industry and has spent many hours in court as an expert witness in personal injury cases. He was a staff writer for two international luxury pen collector’s magazines and had fifteen articles published. In addition, he has self published an internationally acclaimed book on fountain pen inks that sold thousands of copies. This book is still kept in the forensic libraries of the Secret Service, the FBI, the IRS and many big city crime labs. In addition, he’s had a life long interest in firearms and has self published five books on the rebuilding and repair of various models of vintage machine guns. He is currently Federally licensed to make and repair all manner of firearms including both machine guns and silencers. This gives him a unique insight into the world of guns and their realistic portrayal in crime novels. To ask other readers questions about Ashes of Arson, please sign up. Kati MacKenzie is an insurance investigator. When she gets called out to an enormous warehouse fire she has a lot of questions but few answers. She's told the blaze looks suspicious. It appears to have multiple starting points which means arson. Then they find the bodies. Two of them. Both with gunshot wounds to the back of the head execution style. The blaze was just a cover as whoever started it didn't want the dead men found. Unfortunately for Kati, the more she digs the more she put Loved it! Unfortunately for Kati, the more she digs the more she puts her life in danger. She meets two men, both of whom are bent on protecting her. Rex is a police officer working the homicides. Rich is a firefighter she meets at the warehouse fire. Rich is a widower and has a son, Toby, who adores Kati and wants her to be his new mom. When a hit is put on Kati, it puts anyone close to her in danger too. Multiple attempts are made on her life even though she tries her best to stay out of the investigation. Her boss orders her to back off but no matter what she does, its not enough to eliminate the threat. Interesting plot and story line. I found the characters a bit flat and there was too much telling and not enough showing for my taste. Several places I would have edited out some of the wordiness and explanations.